Experience our most popular two-night break and discover the true essence of the Scarlet. Enjoy candlelit dinners in the Scarlet restaurant, our classic clifftop hot tub experience, a short journey spa massage each and end each day falling asleep to the comforting sounds of the sea. Indulge in two nights in one of our beautiful sea view bedrooms with a sumptuous three-course breakfast each morning. Each evening enjoy a three-course dinner in our candlelit restaurant. Make the most of the restorative properties of the Scarlet spa: stretch out with our morning yoga classes, plunge into the indoor pool, relax in the dry heat of the sea view barrel sauna and breathe in the steam in the steam room. During your stay experience a clifftop hot tub: soak your cares away in the steaming hot waters whilst you take in the stunning views of the Atlantic below. Finally, have a taste of our Scarlet Spa treatments with a Short Journey: a short consultation followed by an individually tailored therapeutic massage for 60 minutes. Prices for two nights start from £417.50 per person based on two people sharing a Just Right room. 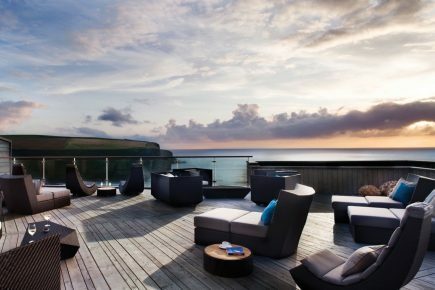 Prices include a two-night stay, breakfast each morning, three-course dinner each night, a cliff top hot tub and a short Scarlet Spa Journey each.